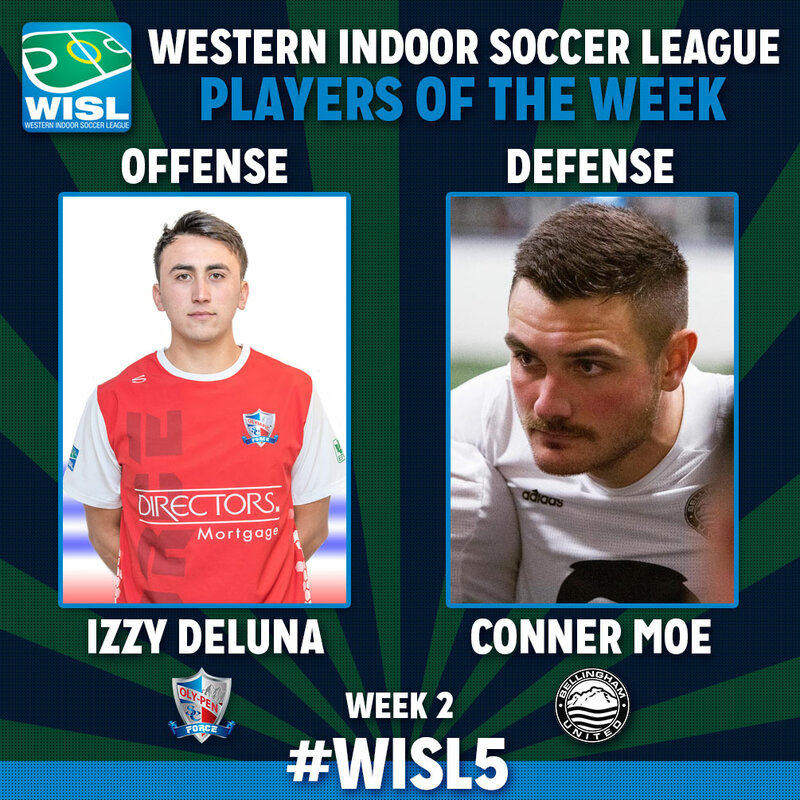 Western Indoor Soccer League coaches and club operators have voted Izzy DeLuna of the Oly-Pen Force as the league’s Offensive Player of the Week and Bellingham United defender Connor Moe as Defensive Player of the Week for week two of the 2018-2019 season. Izzy DeLuna registered a hat trick and an assist and could have had as many as six goals if not for three clearances off the line by Bellingham United defenders in the Oly-Pen Force’s 11-6 loss to the Hammers. The veteran Force player from North Kitsap high school and Olympic College played an all around solid game contributing on defense and as a pivotal part of the Force’s penalty kill. This is DeLuna’s second Player of the Week honor. He was named Defensive Player of the Week one year earlier in a 14-8 win over the Oly Town Artesians. On the other side of the ball, Bellingham United’s Conner Moe was part of a stubborn defense that kept the Force off the scoreboard until finally allowing a power play goal in the last 30 seconds. He was part of a penalty kill unit that killed two power plays. Moe, a Snohomish High School grad and Montana State-Billings alum, scored a shorthanded goal as part of the man down line and scored another out of the back to help lead the Hammers to an 11-6 victory. Bellingham’s Uriel Herrera (3 goals, one assist) and Snohomish’s Tye Hastings (2 goals including the game winner with 2:50 left) were also nominated for Offensive Player of the Week while Oly Town goalkeeper Bradley Hanson was the other nominee for Defensive POTW. This is Bellingham’s second POTW winner, joining Jared Davis in week one. Tacoma Stars Reserves goalkeeper Mike Arguello was named Defensive POTW for week one.